The Worcester Polytechnic Institute Wireless Association has its roots in the beginnings of Amateur Radio. The group was first founded in October of 1909, by Oliver B. Jacobs and a group of 40 other men. 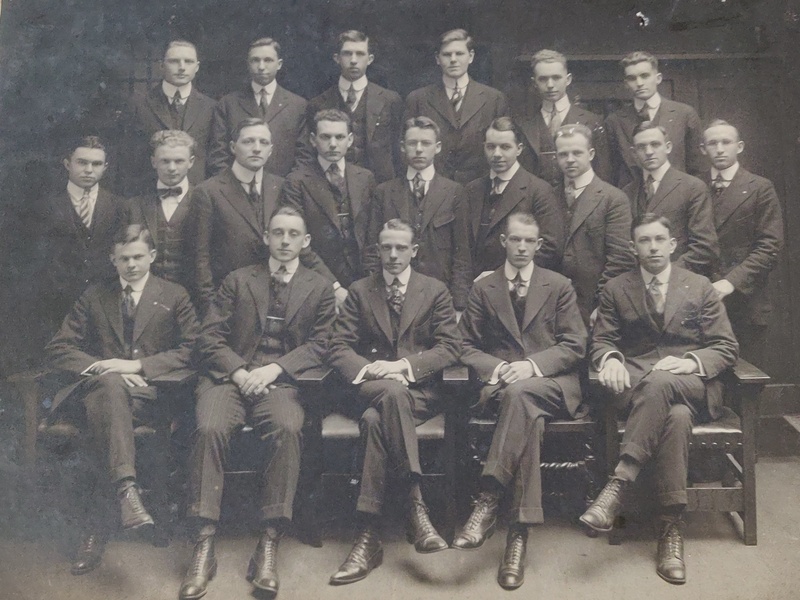 The club was inspired by a similar group at MIT, and the speaker at the first meeting of the WPI Wireless Association was the President of the MIT Wireless Society, Edmund Moore. The club was given some space in the third tier of the Electrical Engineering building, which was used for experimentation as well as research using a trolley car, which was sent throughout central New England. The club's first station was started in December of that year, and consisted of a transmitter, running to a flat-top antenna on top of the EE building, and a receiver with a design centered around a detector. The transmitter operated at a wavelength of about 600 meters, and the range was under 30 miles. The operators used Morse and Continental Codes in transmission, and used the call "WPI". Thus WPI was on the air before MIT's similar club, as MIT was having trouble finding aerial supports. This makes WPI the first operational college radio station in the United States. Over the years, the technology used in the club's homebrew rigs improved, and the club gained in popularity. Each day at noon students and faculty gathered around the receiver to set their watches to the signal from the Navy station at Arlington, Massachusetts at 12:00 noon. By February 1910, the station heard which was at the greatest distance was at Wilmington, Delaware. The club began experimenting with Wireless Telephone the following year, and continued experimentation with their spark CW station, and eventually improved transmission range to 175 miles. In February of 1916, the government granted the WPI Wireless Association its first license, which was 1YK. In addition, only licensed operators could use the station, so this is when the WPI Wireless Association started giving license classes. In 1917, the club was silenced by the Navy due to the outbreak of World War I. Although most stations were prohibited from receiving as well, due to WPI's history of experimentation and service, the District Radio Inspector allowed the Wireless Association to continue improving on their receivers. In the fall of 1919 the club returned on the air. On December 30, 1920, the Worcester Polytechnic Institute Wireless Association became an "Affiliated Club" with the recently formed American Radio Relay League. The club's affiliation continues to this day. In 1921, the Wireless Association became one of the few stations to use a "multiple-tuned antenna", which used capacitors and inductors to resonate the antenna. In this year, the club also found a new source of power for the station - the trolley tracks which ran in the EE building, which supplied from 300 to 500 volts, which allowed higher power output. This allowed the Association to begin transmitting play-by-play accounts of basketball and football games that were played at the school, to allow the other team's students to hear the progress of the game. 1921 was also the year of the first Transatlantic Tests, when stations in America and Scotland tried to hear each other across the Atlantic Ocean. WPI was one of the first 12 stations heard by Paul Godley, an American who went to Scotland to conduct the tests. Due to some problems with the station, WPI was running only 20 watts into their antenna This gave WPI more fame and insight into skywave propagation. In 1923, the club started handling traffic, mostly for Tech students, and was handling over 400 messages a month at times. Over the years, the Worcester Polytechnic Institute Wireless Association has been at the forefront of radio technology, as the school has been in other fields. Robert Goddard, the father of modern rocketry attended the school, as did Atwater Kent, who did experimentation with radio as well. Today W1YK is still experimenting in modern modes of Amateur Radio, such as packet radio and satellites. W1YK boasts a modern equipped station, now including a Yaesu FT-1000MP and FLEX-6300 SDR on HF, feeding monobanders on 40, 20, 15, and 10 meters, and also operating on 80 and 160 meters. The club is active on VHF and UHF as well, and W1YK also operates several repeaters. The club station is located on top of Salisbury Laboratories, another academic building on campus. With the antennas on top of twin towers, one being 60' tall, on top of the 60' building, W1YK has some of the best coverage in New England. The club has won many awards, and has had some memorable contacts. W1YK contacted the space shuttle on one flight, when DP0SL was on board, and experimented with moonbounce in 1978.